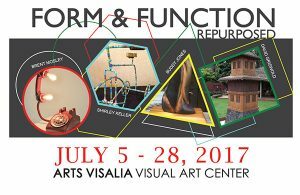 Reception: Friday, July 7th, 6-8 p.m.
Arts Visalia is pleased to present Form & Function Repurposed, an exhibit hosting four artists who utilize rescued materials to create new forms with dimension and storyteller emphasis. Brent Mosley is the Board President of the Arts Consortium. Brent has a keen eye and actively creates art. Each piece is unique but shares a commonality of surreal beauty. He is a photographic DJ via his website Sleekmaus and has explored many other avenues of art as well. Shirley Keller currently resides in Three Rivers and is a part of the First Saturday arts events in Three Rivers. She works with clay, photography, and mixed media. Shirley has worked with clay for approximately 8 years and many of her pieces incorporate dot work which was inspired by painters from Mexico and Australia. She began painting dots on thrown away objects, turning them into recycled art. Buddy Jones is a wood artist. His latest piece is a wood sculpture at the southeast corner of Main and Church in Visalia. He sculpts many decorative pieces from rescued wood and collects abandoned wood from various places throughout the Central Valley. He began selling his wood art pieces over 15 years ago at local fairs. Buddy is very involved in community outreach with the Arts Consortium, Boy’s and Girl’s Club, and Buddy Jones & Friends. David Griswold began creating bird houses after asking one of his clients if he could have the wood from his barn that had blown down. Made from Sierra “heart” redwood, it was lumbered in the local mills and was a prominent material for the late 1800s construction era. The texture of the lives of the farmers of this era is represented in the wood he recycles and tells a story of purpose and struggle in an environment not always compliant with the wishes of the new steward. David’s pieces incorporate Asian themes and architectural structures found in the Central Valley.